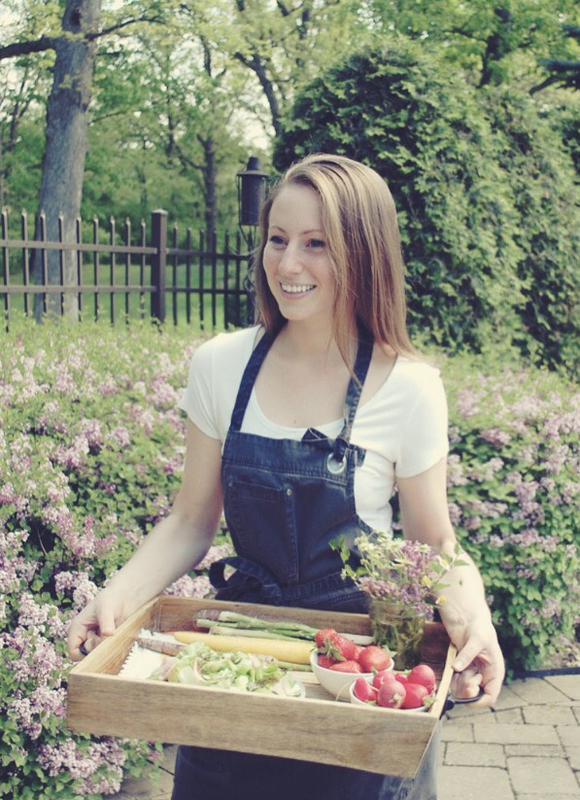 I am so ready for cozy pies and nights by the fire, but I’m definitely not ready to see all the summer fruit go. The result? 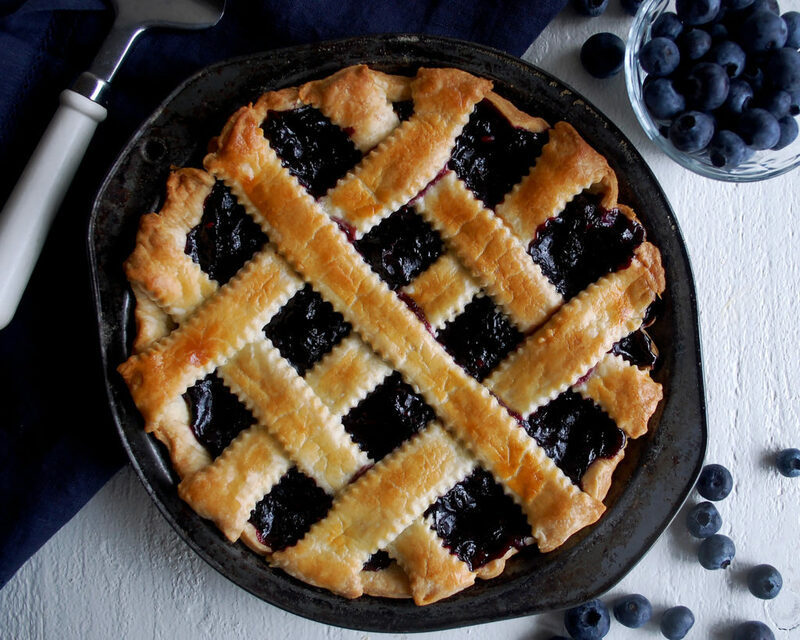 A homemade blueberry pie. Sometimes the simplest of things are the greatest pleasures. 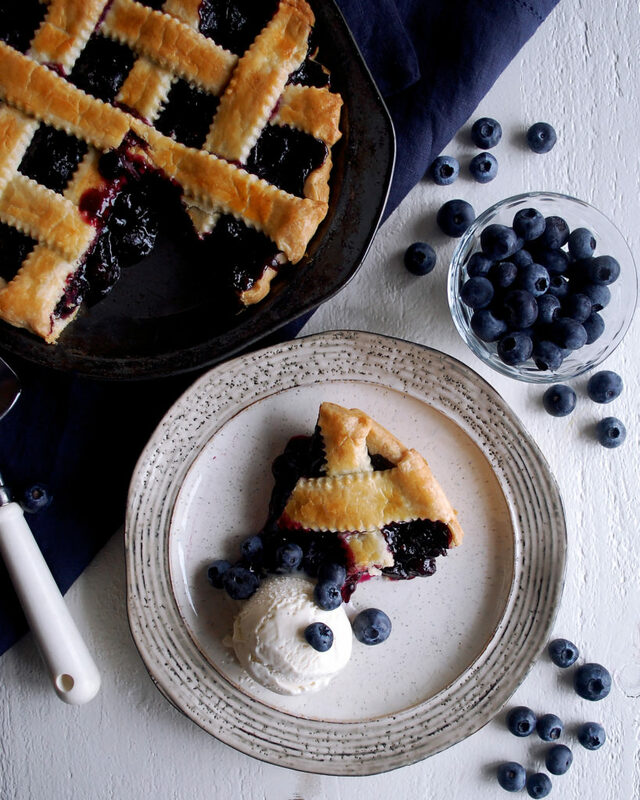 For me, a homemade blueberry pie is one of those things. It’s just such a “feel good” experience to make a pie from start to finish. The hardest part is patiently waiting for it to come out of the oven. 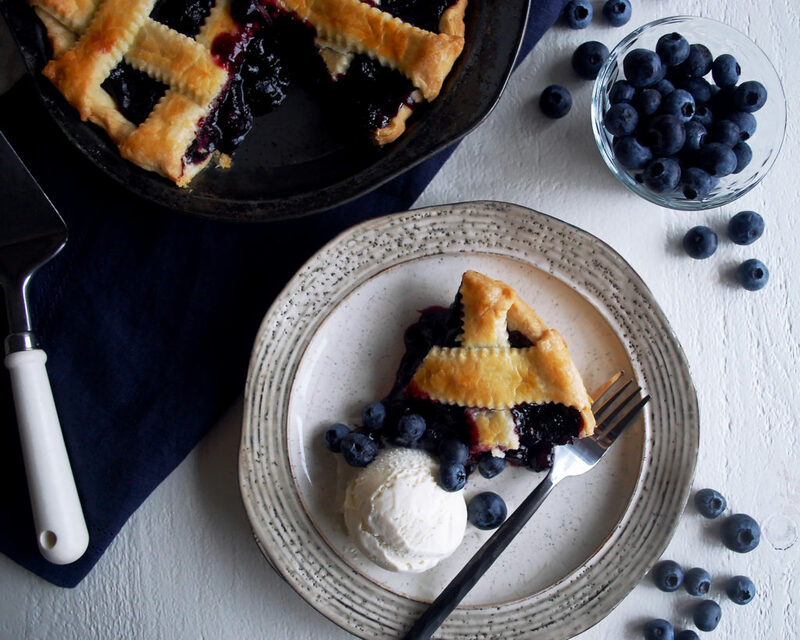 A bubbling, warm pie fresh out of the oven with a large scoop of ice cream on top? Yep, sounds about perfect. With the days feeling like fall lately, I am definitely getting excited for all things cozy and comforting. So, pie is definitely in order. But believe it or not, I still have some beautiful fresh blueberries in a big box that my grandma gets from Michigan every summer. I figured that even though it’s getting a little chillier, there’s no reason to completely rush summer out just yet. I’m going to be doing a full post on how to make pie dough sometime this fall, just like the other “how to” posts I’ve written on fries and steak. In the meantime, all you need to know is that homemade dough is definitely the way to go. It’s easy, and once you get the hang of it, you’ll wonder why you ever bought pie crusts from the store. The filling is super classic and that’s why I love it. I considered mixing things up and adding other flavors to the equation, but honestly, some dishes are just better left alone. Like I said, simple food is sometimes the best when done really well. So, take your time to make the dough. Let it rest the full hour. Use fresh blueberries. And use a pinch of salt to really bring out the blueberry flavor. 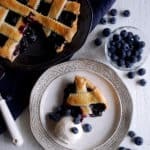 Alright, so we have lots of fall recipes to get excited for coming up, but for now grab some blueberries and finish the summer off on a sweet note! Enjoy! Preheat the oven to 375F. Grease an 8” pie pan with butter and set aside. Unwrap the dough ball and turn it out onto a floured surface. Cut the dough into two equal pieces. Rewrap one half of the dough and return it to the refrigerator. Roll the dough that is still out (it may need to temper for about 5 minutes so it can roll easier) into a circle about 1/8” thick. 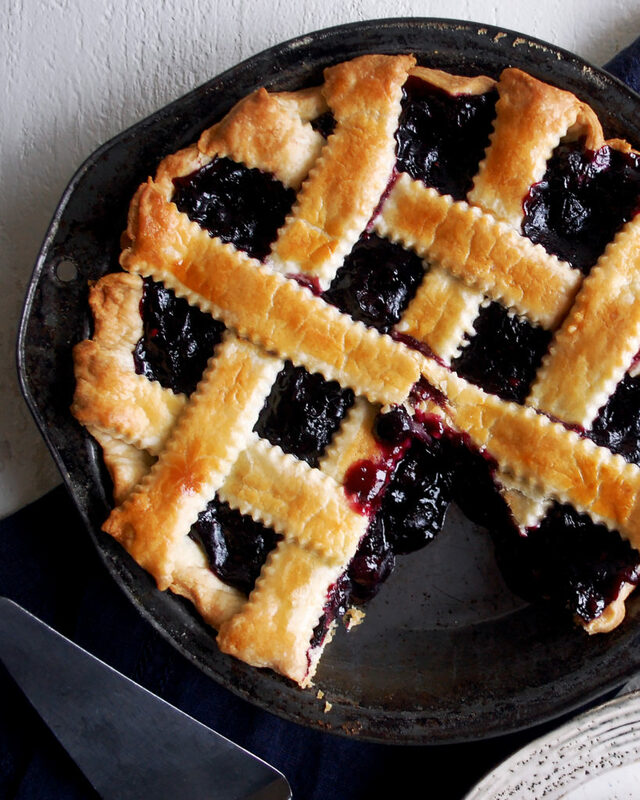 Gently lay the dough into the pie pan, making sure to press the dough into the creases of the pan. Trim the dough around the sides so that only ½” of dough hangs over the pan. Use your fingers to crimp the edges. Use a fork to dock the bottom of the dough (this allows steam to escape while baking). Cut a piece of parchment paper into a circle, just about the size of the entire pie pan. Lay the parchment paper lightly on top of the dough. Add pie weights to the pan (rice, beans, etc. will work). Par-bake the crust for 10 minutes. Remove the pie weights and parchment paper. Meanwhile, heat a large sauté pan over medium heat. Add the butter and let melt. Add the blueberries. Sauté for a minute. Stir in the brown sugar, corn starch, and salt. Let the mixture come to a bubble. Simmer for about 5-8 minutes until the liquid from the blueberries has been evaporated and the mixture has thickened. It should be glossy and smooth. You also want to make sure the cornstarch flavor has cooked out. Pour the blueberry filling into the par-baked pie crust. Take the remaining dough out of the refrigerator and let temper for 5 minutes. Transfer it to a floured surface. Roll the dough out to the same thickness as the first half. Cut the dough into 1” strips (I used a ravioli cutter to get the jagged edges). 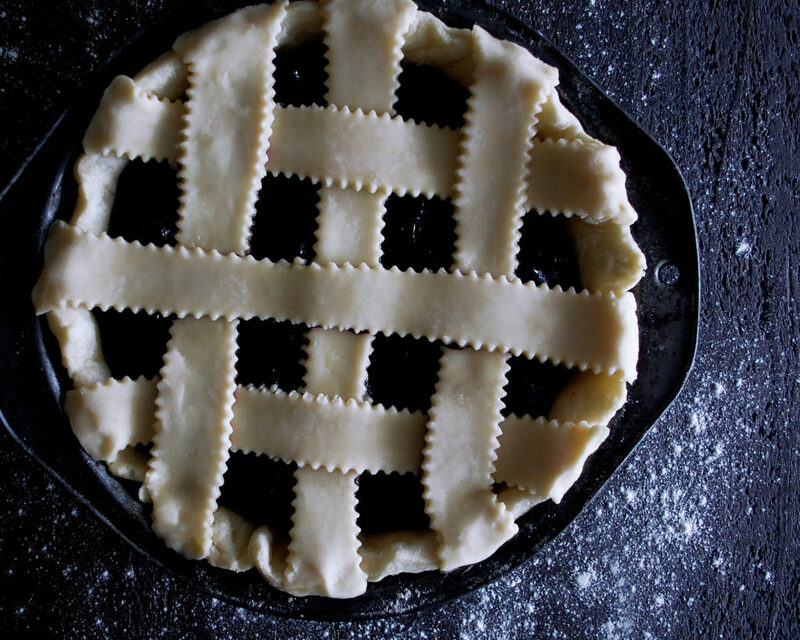 Create a lattice pattern on top of the pie using the strips of dough. Trim the edges of the strips and press them into the bottom crust. You can also tuck the strips into the filling so they stay put. Bake the pie for 35-45 minutes in the 375F oven, or until golden brown and crisp. 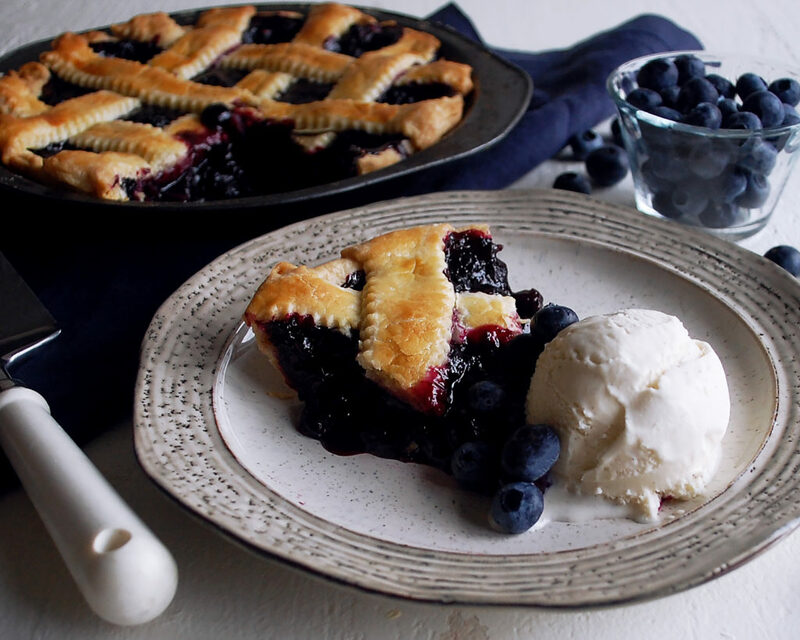 Serve the pie warm with vanilla ice cream. Other fruits would work here, too. Maybe strawberries, plums, or even apples. OH MY. Looks delicious; Wish I was there to share it with you. I shared it on FB.